An oft-repeated line in the financial news lately is talk of a 'two-speed' economy, the resource sector, and everyone else, with the miners making all the money, but sometimes that is not a bad thing. In the case of Brisbane manufacturer Coach Design, they have used a MAN truck chassis as the basis for their new bus, and it works a treat. 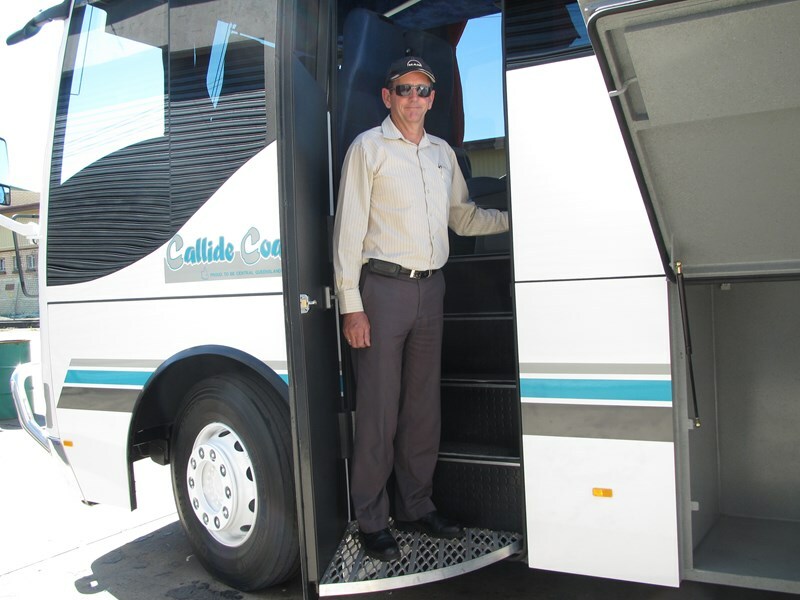 Central Queensland operator Callide Coaches needed a bus to service a mix of applications including school runs and to carry mine workers in and out of work sites, running across some poor quality roads. Drawing on their experience in adapting MAN truck chassis to bus applications, including 4x4 versions for off-highway tourism operations, Chryss Jamieson, Coach Designs' Director, presented a 4x2 bus able to deal with the rigours of rural travel. 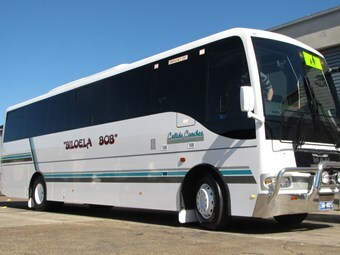 Christened 'Biloela Bob' in honour of its rural operating routes, the bus incorporates plenty of tricks Jamieson and his team have learned over the years, including a slightly raked windscreen with curved and rounded A-pillars for better air penetration. This not only improves fuel consumption over a more slab-sided design, but also helps to reduce wind noise as the air is directed over and around the body. Given the strong possibility of having a close encounter with the national coat of arms as it runs or bounds across the road, plus assorted other fauna, Jamieson has incorporated a polished alloy bullbar. 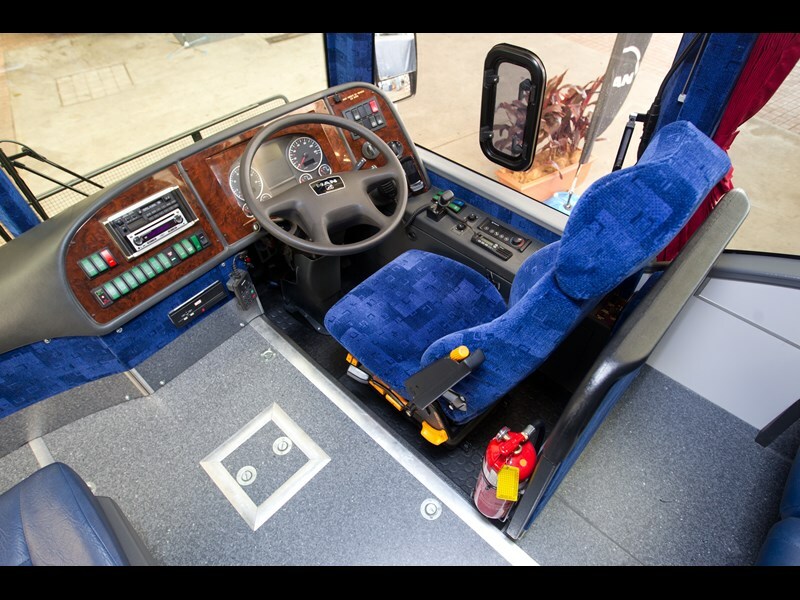 The wheels and tyres are also standard truck fitment along with the mirrors, which offer electronic adjustment from the driver's seat, including one offering a view across the front for close parking. Access panels running the length of the chassis provide access to the engine, fuel tank, transmission and luggage compartments, with the body mounting directly onto the truck chassis. The MAN is slightly unusual in that the engine and gearbox are at the front with luggage at the rear. Unlike traditional bus designs, the luggage bins are not 'through bins', thanks mainly to the 'backbone' chassis running down the centre of the bus; however Jamieson says this can be addressed to meet specific needs. 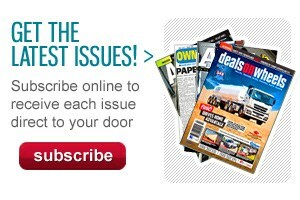 Another impressive touch is the swing out step mounted to the front door. Fashioned from a heavy metal grate, it is not only strong enough to hold a fully-equipped mine worker but cleans boots effectively to help keep the interior tidy. The fit and finish is good, and having seen the Coach Design team in action this is no surprise. Jamieson encourages attention to detail so issues surrounding design and construction can be addressed quickly to ensure a quality product leaves the factory. 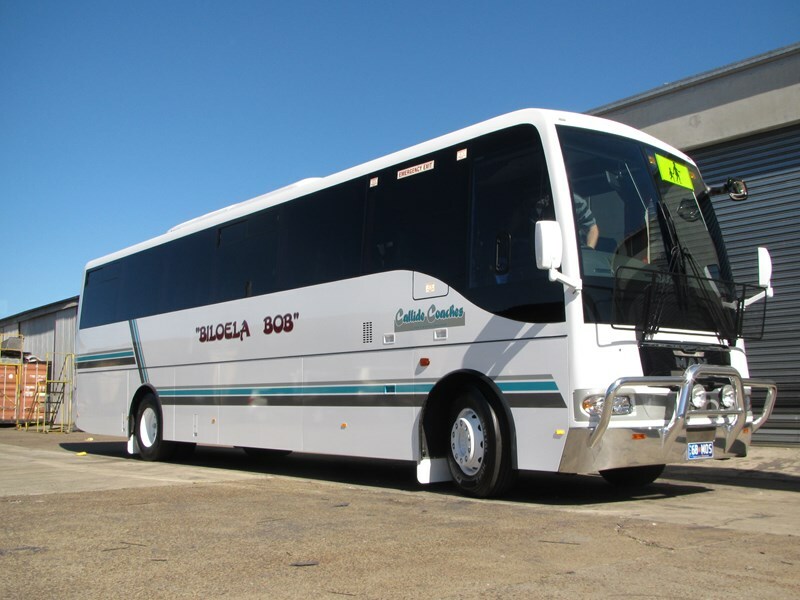 As with all custom jobs, there is a fairly wide palette of colours available to prospective operators; while 'Biloela Bob' is white with tri-colour striping other combinations can be created. Like Neil Armstrong in reverse, entering the coach for the first time was a giant leap for a man, until I realised the MAN electronically controlled air suspension (ECAS) was set at its maximum. For crawling across washouts or other road corrugations, the driver can raise the suspension with a push of a button, while a 'kneel' function takes care of passenger entry and exit. Unlike 'standard' bus design the driver sits lower than the passengers, which gives everyone a good view of the scenery, while the entry steps are actually behind the driver's seat, so passenger entry and exit is monitored via the internal mirror. The driver's seat is a little snug for entry and exit because of the engine cover, however there is plenty of space behind the height and reach air-adjustable steering wheel; just release the lock, move it to the preferred position, then lock it in place. Interestingly, the driver's seatbelt is a lap unit only, while the air-suspended driver's seat is not only large and welcoming but also comfortable, offering plenty of support to ensure driver fatigue is minimised, even on long journeys. The dash is simple and easy to read, with large dials for speed and engine revs, plus smaller ones for air brake pressures, fuel level and water temperature, as well as an LCD screen for gear position, ride height and engine operating information. To the driver's left is the AM/FM/CD stereo which also feeds into speakers throughout the passenger cabin, as well as the usual bank of rocker switches for doors, lights, sun blinds and other ancillary functions. For those not familiar with the ZF AS-Tronic automated manual transmission (AMT), the gearshift can be a bit confusing, with no clutch pedal and a column-mounted stalk for shifting between ratios. Best of all, the controls are all within easy reach. Perhaps not surprisingly for a German design the ergonomics are very good, major controls fall immediately to hand, while lesser used ones are further away so as not to cause confusion. A random test of passenger seats found they are comfortable with reasonable leg room for most body shapes, with a wide centre aisle allowing easy access all the way to the rear of the bus. The interior fit and finish is excellent, there were no loose edges or seams, all windows are flush with the body, while the flooring are well secured to ensure a long service life. The MAN uses a Euro 5-compliant 6.9-litre six cylinder engine, producing 213kW and 1150 Nm of torque, which is plenty in truck guise so in the lighter bus makes for easy acceleration. Fitted with the 80db noise reduction kit, the engine is a low rumble under the floor. It does get slightly loud as the revs build but avoids being intrusive, even at high revs. The steering is direct with only a small dead spot at the straight ahead position with minimal 'slop', and all inputs produce a corresponding movement at the wheels. After less than a kilometre of driving, the steering felt intuitive and predictable; there was no guessing about how much lock was needed, while the overhangs did not cause any problems with clearing corners cleanly. Having tested MAN trucks previously, the integration of brakes and transmission was exactly as expected, with smooth shifts that get better as the load increase. While the exhaust brake reduces service brake applications in general driving, a simple lift off the throttle would open the brake valve and wash off excess speed. With 12 gears to play with, the computer can race through shifts, getting to the highest gear for the road speed for maximum fuel economy and reduced exhaust emissions. One failing of AMT is 'hunting' for gears under acceleration from a rolling start; the transmission will try and hold a higher gear before dropping a couple of ratios to provide a burst of acceleration. The brakes are progressive. 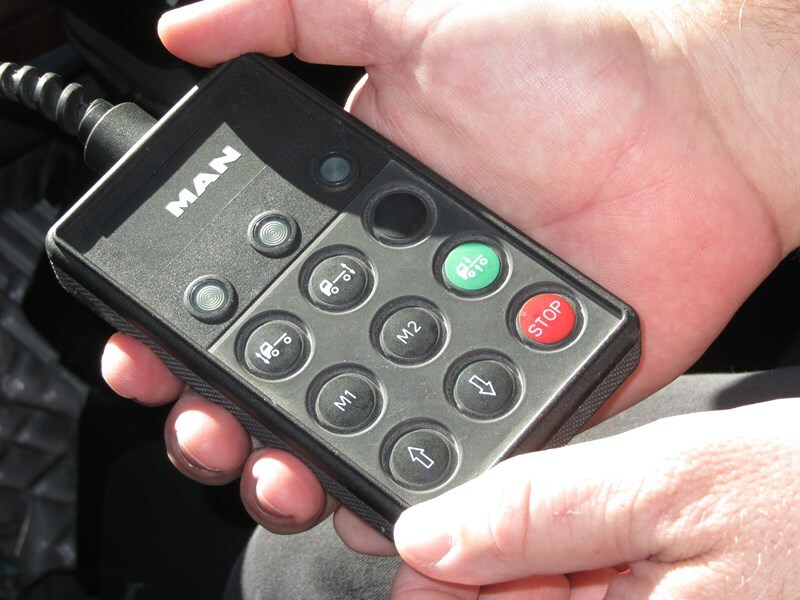 Although air brakes generally lack feel, the MAN system allows the driver to modulate the pedal preventing the brakes from 'snatching', especially when lightly loaded. With airbags front and rear, ride comfort is not an issue. The MAN just rolls over corrugations, leaving the airbags to soak up the bumps so that the cabin only gets a faint shudder over even the worst roads. The MAN is an impressive unit to drive, with barely any signs of its truck heritage showing through, and the ones that do are all positive, such as the ECAS system for raising and lowering the body. Most importantly, it is easy to drive, very little effort is required, so that even on long trips or across harsh terrain the driver is not exhausted, while passengers will enjoy the low noise levels and excellent suspension. 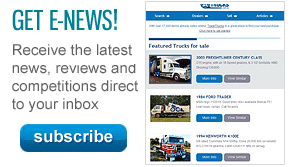 Find MAN buses for sale. Search for new MAN specs. What started off as a rethink of MAN’s school bus offering has generated a world leading bus design.